My little pony was first introduced by Hasbro in 1983 with a 10" tall plastic figurine that could swish its tail, wiggle its ears, and wink an eye. The ponies featured on fabric are Pinky Pie, Twilight Sparkle, Rarity, Applejack, Fluttershy and Rainbow Dash. 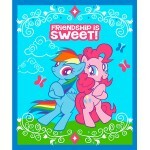 We have a large collection of My Little Pony fabrics at discount prices for quilting, crafts, home decor, apparel or anything you desire to create..
My Little Pony Say Yes to Adventure Cotton Panel, This fabric is great for quilting, sewing, craft, ..
My Little Pony Friendship Panel, This fabric is great for quilting, sewing, craft, and home decor pr..
My Little Pony Heart Toss White cotton fabric for quilting, sewing, craft and home decor projects..